PYEONGCHANG, SOUTH KOREA - The neighbors don’t get along but you are still obliged to invite them all to the party. So where do they all sit? 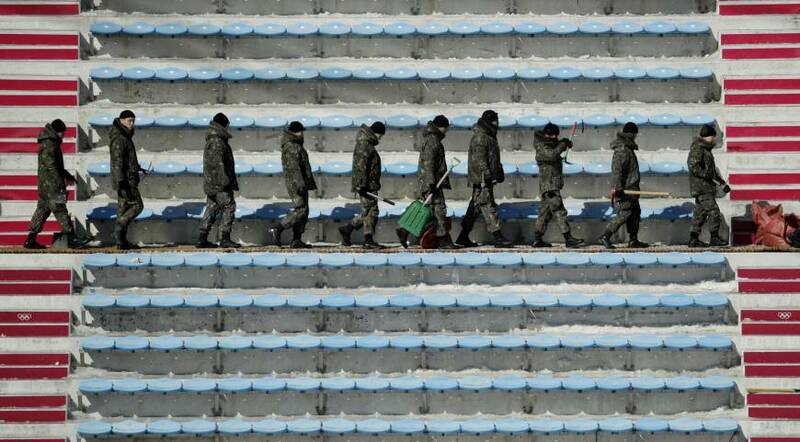 That is the question facing South Korean President Moon Jae-in with less than 48 hours to go before the opening ceremony of the Pyeongchang Winter Olympics. At any other games, seating your top guests is standard fare: A host country’s leader and the head of the International Olympics Committee (IOC) take the top seats, surrounded by visiting heads of state and other VIP guests. For the Moon government, it is proving much trickier. Two of his top VIPs are from the United States and North Korea, which have traded nuclear threats. And another is the prime minister of Japan, which has tensions with both North and South Korea. South Korea wants to use the games to re-engage with the North and encourage friendly encounters between Pyongyang and Washington, but is also anxious to avoid any awkward moments — a tall order, according to officials in Seoul. “This is a protocol headache,” said one official familiar with the logistics planning. Moon’s guest list includes U.S. Vice President Mike Pence and two of the North’s most senior officials: North Korean leader Kim Jong Un’s younger sister and the North’s nominal head of state. Complicating things further, Pence on Wednesday promised tough new sanctions against North Korea. And as his guest at the opening ceremony, Pence is taking the father of Otto Warmbier, an American student who died last year after being imprisoned in North Korea for 17 months. “How close should the North Koreans and Americans sit, when Washington has been so public about sanctions and pressure against North Korea? And who takes a higher seat?” the official said, asking not to be named because of the sensitivity of the matter. While in South Korea, Pence will also visit a memorial for 46 South Korean sailors killed in 2010 in the sinking of a warship that Seoul blamed on a North Korean torpedo attack. Final arrangements for the opening ceremony have yet to be confirmed, but South Korea assumes Pence will want to keep his distance from Kim Yo Jong, 28-year-old sister of the North Korean leader, as well as from ceremonial head of state Kim Yong Nam, said another official in Seoul on Wednesday. Kim Yo Jong is a senior propaganda official who is blacklisted by the U.S. Treasury Department for alleged rights abuses and censorship. Prime Minister Shinzo Abe, who met Pence on Wednesday and agreed they could “never accept” a nuclear-armed North Korea, is also among some 20 heads of state and top political leaders to attend the games. Japan has historically strained ties with both North and South Korea, having occupied the peninsula for decades leading up to World War II. Tokyo and Seoul also have a territorial dispute over islands in waters between the two countries. To avoid offending Japan at the games, a South Korean figure skating pair decided to change the lyrics of a popular Korean folk ballad that will form part of their routine, dropping a reference in the song to disputed islands. An Olympics organizing spokeswoman said Moon’s office was managing the seating chart for the VIPs and that the committee had yet to be briefed on the final decision. A spokesman for the Blue House declined to comment. “Normally you have one side (of the seating) which belongs to the IOC and the other side which belongs to the organizing committee and the host country,” IOC President Thomas Bach told a news conference. Pence is due to arrive in South Korea on Thursday, coinciding with the arrival of the North’s ceremonial leader, who is the most senior North Korean official to enter the South since the 1950-53 Korean War ended with a truce. Kim Yong Nam is president of the Presidium of the Supreme People’s Assembly, while the reclusive country is ruled by Kim Jong Un, the third-generation hereditary leader. If Pence were to meet Kim Yong Nam, he would be the most senior U.S. official to meet a North Korean leader since President Bill Clinton met Vice Marshal Jo Myong Rok, a special envoy of Kim Jong Un’s father, Kim Jong Il, at the White House in October 2000. “Kim Yong Nam is a nominal head of state; he should be seated closer to Moon than Pence. Yet Pence is from South Korea’s steadfast ally,” said Christopher Green at the International Crisis Group think tank. 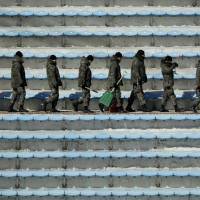 Moon for months has tried to bring North Korea to the games in the hope that better ties would help reduce the risk of a fresh war on the Korean peninsula, and are hoping that its participation would lead to rare talks between the old foes. But there is a risk all this goodwill could backfire, warned Lee Kang-rae, a former presidential official in charge of diplomatic protocol. “It would not look good if North Korea and the United States would sit side by side and remain icy and confrontational the whole time, and those images are broadcast for the whole world to see,” Lee said.